I had a go at Hazelnut Caramel Flapjacks again today. I made these first for the ski trip in April, but having successfully made Dulce de Leche recently I thought I'd try it with that instead of my usual condensed milk caramel. Melt the syrup and butter. Stir in the oats. Press into a lined tin and bake at 180 degrees C until golden brown. Meanwhile, combine the milk and sugar in a saucepan. Heat until the sugar is melted, then bring to the boil and simmer until it's thick and caramelly (I paraphrase here, because I only recently wrote this recipe up on my blog). Beat until smooth, then pour over the flapjacks. While the caramel is cooking, toast the hazelnuts for 3-4 minutes under the grill, then bash with a rolling pin until broken up. 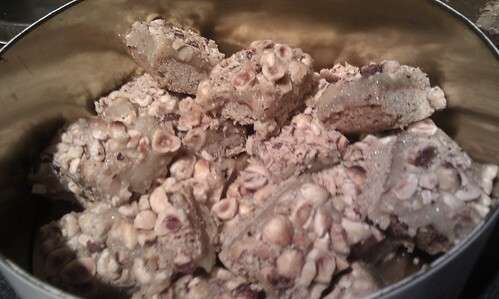 Sprinkle over the caramel and press in gently, so the nuts set into it. These aren't as good as the original. The dulce de leche is a bit too subtle for the other flavours, so the result is very sweet but without any of that lovely caramel flavour. It also hasn't set particularly hard so they're quite sticky. I'll take them to work tomorrow for proper testing, see how they go down. 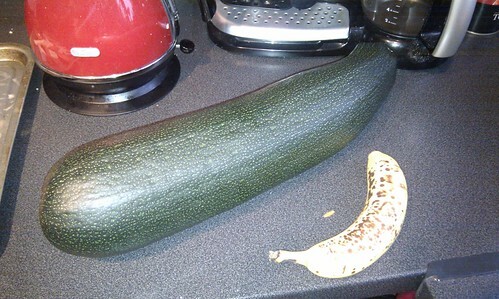 A gigantic courgette also arrived in my kitchen today. Look at it! It's a monster. Father Z rang me this morning. He asked if I still ate ratatouille, and whether I'd like a courgette. It did cross my mind to enquire what good a single courgette would be, but now I understand. I can see myself hacking bits off this to use all week, like it's an enormous ham or something. This evening I cut off the end, grated it, squeezed out the liquid, mixed with a beaten egg and seasoning, and then baked in mini cupcake moulds to make little courgette cakes for my Bento boxes. It worked very well, but but the test'll be lunch tomorrow.